Theme: The living connections that make us one world, one people. Artist: Nicole Smith, Art Major, Alfred University, NY. Theme: Laura Esquival’s novel about Tita, a woman whose emotions impact others through her food. Medium: Fabric collage and ink drawing. Artists: Navigators USA chapter (ages 5-14) at Countryside Church, UU, Palatine, IL. heme: Harsh working conditions and low pay put affordable food on our tables. 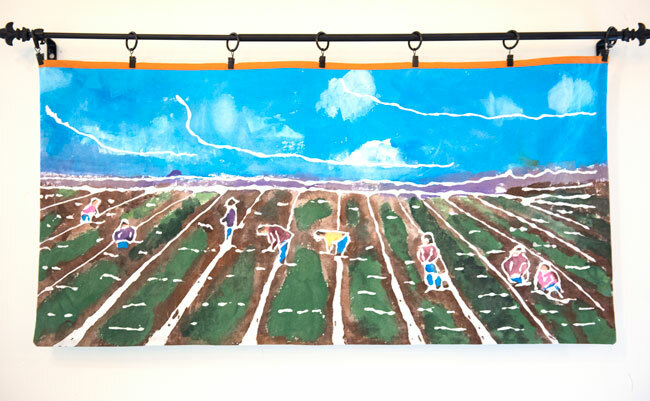 Medium: “kid-friendly” batik process with washable glue and permanent acrylic paint. Artist: Rev. Kendyl Gibbons, All Souls UU Church, Kansas City, MO. Theme: Anonymous volumes honor those who have suffered for what they have written. Ribbons Not Walls is sponsored by the Unitarian Universalist Humanist Association. 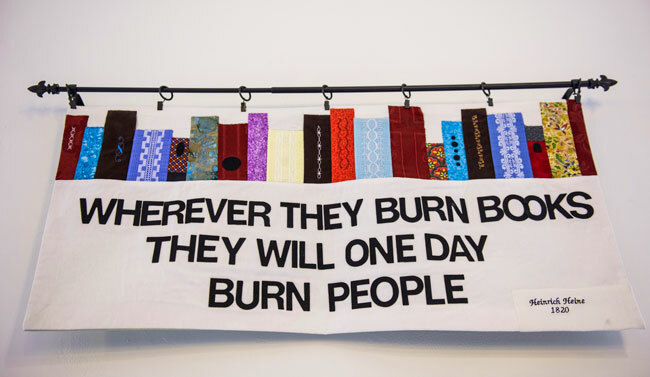 It was inspired by another UUHA social justice project, “Banned Books by Hispanic Authors,” which collected over 400 copies of books removed from Tucson classrooms when Arizona outlawed the teaching of “Ethnic Studies” in public Schools. These were displayed at the UU General Assembly in Phoenix in 2012, then donated to Puente, a local community organizing group. Similar local libraries were established at Hispanic Community Centers in Louisville, Tucson and El Paso. 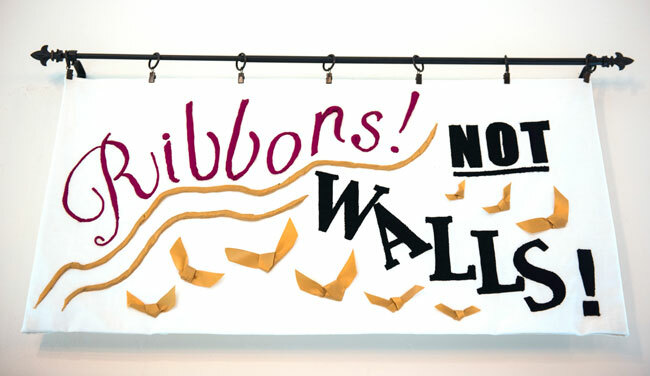 Ribbons Not Walls is curated by Roger and Katherine Brewin, 10559 S Wood St. Chicago, IL 60643. Contact them at 773 551 8540 or rabrewin@aol.com. Thanks to Jim Morison for this installation. 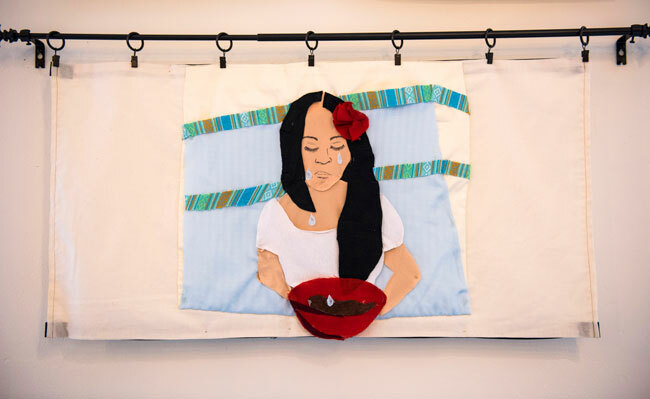 On behalf of the Board and staff of the UU Humanist Association, we are pleased to transfer custody of four fabric art panels from the UUHA immigration project, Ribbons Not Walls, to the UU Church of Brevard for permanent display. These works by artists Kendyl Gibbons, Barbara Kurtz, Nicole Smith and the UU youth of the Navigator Scouts chapter in Palatine, IL are part of a larger collection that has utilized art to carry a message of welcome and inclusion to audiences around the country. 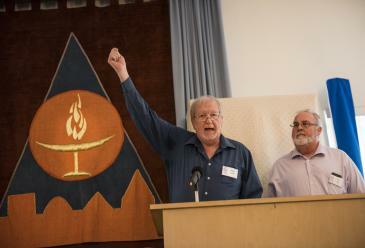 We are delighted that they will now help welcome members and visitors alike to UUCB, and will remind all who enjoy them here, of the highest values of both Humanism and Unitarian Universalism.